Alberta Wilderness Association (AWA) would like to thank the Alberta government for their decision to protect the Castle wilderness area and following through with establishing the boundaries for the Castle Wildland Provincial Park (WPP) and Provincial Park (PP). We are writing to provide detailed comments on the January 20 2017 draft management plan and to express on behalf of our members and supporters, our disappointment with the process for developing the plan. We emphasize that messaging from the government in the last two weeks has been confusing. The planning process has been difficult and complicated; it was initially bolstered with the strong statements from Premier Notley at the Pincher Creek News conference, only to be weakened by the subsequent announcements regarding motorized recreation. We and many others have interpreted the government’s announcement made on March 1 to mean the government plans to continue unfettered motorized recreation throughout the Castle for at least another year. We are asking the government to please be explicit in your intentions regarding motorized recreation within the Castle Parks. What we have seen unfold over the last few weeks is confusing for the general public. For example, you have announced that the draft plan is being altered even before the consultation period finished. At this point in time, our members were beginning to engage with the plan as it was originally presented, and now you have announced a revised plan. Further, we are also expressing frustration that many feel with the quality of the questions and the design of the online survey. To help you receive a broad response rate, please ensure your office will take the comments that people are writing in personal letters and postcards to you as many have simply given up on the survey in favour of a personal letter, email or post card. The comments and document following this letter are limited to the draft plan as it was released on January 20, 2017. Alberta Wilderness Association (AWA) appreciates the opportunity to provide feedback on the draft Management Plan for the Castle Provincial Park (PP) and Wildland Provincial Park (WPP) and would like to begin by thanking the government of Alberta for their decision to protect the Castle wilderness region. The Castle is a region of outstanding wilderness values. As the essential piece of an ecological puzzle, the Castle connects those Canadian and US National Parks to the south and the Flathead Basin to the west with those habitats and populations in the mountains and foothills to the north. With numerous overlapping ecosystems in one relatively small area, the Castle Wilderness contains one of the highest animal and plant species diversities in Alberta. We know that truly protecting the Castle as a keystone piece of Alberta’s biodiversity mosaic requires comprehensive management plans and regulatory enforcement. AWA supports the Government of Alberta’s commitment to increase headwaters protection and security by increasing the boundaries of the Castle WPP. We agree that the headwaters are more consistent with WPP designation, and will provide much needed increased protections of critical habitat for federally protected westslope cutthroat trout (WSCT). Throughout the past several decades, activities including oil and gas exploration and development, livestock grazing, clear-cut logging, and high-impact recreation, including motorized recreation, have caused substantial disturbance to portions of the Castle. The current plan to continue motorized use in the Castle for up to five more years will continue to degrade this ecologically sensitive landscape and continue to place our wildlife at risk. Continuing to allow motorized recreation is inconsistent with the conservation intent of these parks. AWA knows motorized recreation needs to be banned from these two parks immediately and we do not support phasing out motorized recreation over a 4 or 5 year term. Now is the time to begin restoring this area from the damage of those disturbances. We also know that restoration cannot occur while the activities that exacerbate the initial damage continue largely unabated. AWA is supportive of the vision for these parks, that they are to be managed as world class protected areas, employing high standards in conservation, and respecting Indigenous right, but we recommend amending “providing sites and facilities for exceptional recreational experiences” to “providing opportunities for exceptional recreational experiences”. AWA is concerned with the urbanization of our wilderness areas, as it takes away from the wilderness experience that we believe most visitors would be seeking. The focus on a vision for the parks should not be to provide infrastructure, but to provide a suite of recreation experiences that are compatible with the conservation intent of the park. We note that the goals of achieving a park with ecologically functional and large intact spaces, providing wildlife connectivity and sustaining resilient ecosystems is inconsistent with allowing motorized recreation on this landscape for up to five more years. AWA is supportive of these guiding principles, especially the inclusion of the Precautionary Principle as a guiding principle for these two parks. AWA is supportive of statements to develop linear disturbance threshold targets, establishing connectivity priorities and other appropriate linkages. The Castle is critical for many species with large home ranges. We are pleased that restoration is recognized as a priority for maintaining and restoring biodiversity values on the landscape. We support commitments in the plan to protect current and future species at risk, and to protect and restore critical habitats. There is significant potential for the Castle to assist in the recovery of Species at Risk, for example threatened bull trout and westslope cutthroat trout. We would request that one of the objectives for Species at Risk should be to assist in the recovery of Species at Risk present within the Castle parks. We would recommend the inclusion of clearly outlined strategies to align all management decisions with recovery strategies. AWA agrees with the emphasis of this section on the importance of headwaters protection and acknowledging the potential of the Castle to restore threatened fish species. We are supportive of the objectives and strategies within this section and suggest that specific goals for restoring hydrological function of this landscape are included. AWA supports taking a more ecological approach to the role of fire in Alberta’s ecosystems. AWA does not support fire suppression unless it is for the express purpose of saving communities and lives, and believes it is important to let fires burn naturally where it is safe to do so. This will allow forests and grasslands to restore and will enhance the overall ecosystem. We are therefore supportive of developing a Vegetation Management Strategy which will consider reintroducing fire onto the landscape, and allowing some fires to burn their course naturally. We maintain that cattle impacts to riparian areas, the upper alpine and the alpine need not only be reduced but eliminated, which will mean curtailing livestock grazing throughout the Castle. Past calculations of stocking rates included areas that cattle won’t use, such as steep slopes and other areas away from riparian corridors. This resulted in an artificial inflation in the number of AUM’s available and has resulted in overgrazing in the areas cattle actually use. It is also essential to avoid grazing where competition with wildlife will occur, in order to restore populations of native grazers such as elk. AWA believes a more holistic approach where due attention is also paid to environmental and wildlife issues is required. This means that reducing the stocking rate in some areas will be necessary. AWA is supportive of implementing strategies to help adapt to climate change, both for wildlife and visitors. There is a strong body of science that points to the fact that landscapes high in biodiversity are critical in helping to buffer the effects of climate change. Protecting the Castle will help to play an important role to help build resiliency to climate change. AWA is highly supportive of active engagement and collaboration with First Nations, including cooperative management of the Castle PP and WPP. AWA believes that highway-side regions inside the park boundaries are best left undeveloped and gateway community development should be encouraged. We agree with providing opportunities for recreational activities and wilderness experiences, as long as they are compatible with the overarching conservation objectives of the parks. The proposal to build a visitor centre along the main roadway south of Beaver Mines seems appropriate, given that this area is already developed and contains retail services. This will build on existing services in the area and will provide positive additions to the economy of the regions without creating new disturbances. We agree that facility development within the WPP should be minimal, not encourage urbanization and focus largely on opportunities for backcountry use, and that responsible and sustainable wilderness experiences will serve as a critical component of the success of these parks. AWA is supportive of interpretive, educational and experiential programs being provided in the park. This includes the provision of interpretive kiosks, signs and pamphlets, as well as supporting youth participation in outdoor education. We believe this is an important way for visitors to learn more about their natural environment and promotes stewardship and use of the area. AWA is concerned about the proposal to allow larger scale events such as music festivals and sporting competitions into not only the Castle parks, but other protected areas throughout the province. AWA is concerned these events lead to the commercialization or urbanization of these parks and parks should primarily uphold the natural wilderness values that are expected in protected areas. AWA has concerns about proposals to build hostel style accommodation within the parks. We believe that highway-side regions inside the park boundaries are best left undeveloped and gateway community development be encouraged instead. There are many excellent opportunities for highway-side and other retail services (gas stations, hotels, etc.) in the hamlet of Beaver Mines and along highways 774 and 507, outside the park boundaries. These can be built on existing services in the area and will be positive additions to the economy of the region. Beaver Mines and towns further afield such as Pincher Creek or the Crowsnest Pass are ideally situated to become gateway communities for the parks, and to service park visitors. AWA maintains that urbanization of wilderness must be avoided. Fixed roof structures of any kind, or associated “adventure tourism experiences” are not appropriate within the Wildland Provincial Park. Many of the types of adventure recreation development have impacts on the landscape as well. This includes, but is not restricted to, the concepts of hut-to-hut backcountry travel or via ferrata. In addition to their contribution to the urbanization of wilderness areas, a concern specific to hut-to-hut travel is that where it has been implemented elsewhere, the buildings often end up being misused, occupied for long periods of time (including an entire season), and rendered unavailable for the travellers and kinds of activity for which they were originally intended. There may be scope in the Provincial Park for low-impact adventure tourism opportunities. They also could occur within the Castle Mountain Resort area, but outside the park boundaries, where the landscape is already significantly impacted and is perhaps not a good candidate for reclamation. However, within the Wildland Provincial Park especially, these activities are not compatible with the wilderness experience that we believe most visitors would be seeking. And they are especially incompatible with the ecosystem protection and restoration that should be a hallmark of the park. Careful protection is the highest and best use of these lands, given their extremely high ecological, scientific and natural history value and cultural significance to Alberta. AWA generally approves of random camping. However, random camping is a privilege often abused. Consistent management and enforcement must be in place. Fourteen day limits on random camping are appropriate and offer ample opportunity to hikers and campers to explore and enjoy the surrounding wilderness areas. In the Castle and elsewhere on the Eastern Slopes these limits are being ignored; some campers are simply squatters, setting up semi-permanent camps that last over the course of the season and often over several years. Random camping, if unchecked, often places particular pressure on riparian habitat which is by far the most important for most forms of wildlife. Therefore, we are supportive of the proposal to provide “rustic group camping” opportunities in order to accommodate this need, stressing the need to avoid sensitive areas when creating these opportunities. We believe that these opportunities should be provided at a low cost and available on a first-come, first serve basis in order to accommodate local communities. We support the management of human waste at these sites through the installment of washrooms and garbage receptacles. AWA would like to request that more research be completed and careful consideration be taken on the potential impacts that caving activities may have on bat populations in Alberta. Caving has been singled out as the cause for the introduction of white-nose syndrome to bat populations elsewhere, and AWA is concerned about the potential of this disease spreading to Alberta. AWA has outstanding concerns about the reasoning for allowing hunting in the Castle Provincial Park, but we support hunting within the Wildland Provincial Park as a compatible use. The only hunting currently allowed in an Alberta Provincial Park is the Elk management hunt in Cypress Hills Provincial Park. This is an exception that exists for a specific documented reason; we would request that analogously that any reasons are explained for the Castle Provincial Park. One of the cited reasons is that adjacent private land may be impacted by not allowing hunting within the PP. We would request that any information be disclosed about any documented negative impacts on landowners adjacent to other Provincial Parks before this reasoning guide the management of the Castle PP. AWA remains concerned about the reasoning for allowing hunting within the Provincial Park and the precedent it may set for future parks. We therefore request that hunting not be allowed in the Castle Provincial Park. Plans to allow off-highway vehicle (OHV) use in the Provincial Park and Wildland Provincial Park for up to five more years constitutes a significant concern. The Castle encompasses an extensive network of trails used for OHV recreation – some designated and some not – that far exceeds linear disturbance density tolerances recommended in the recovery plans for species at risk that are found in the area, such as those for the grizzly bear and the westslope cutthroat trout. For these species populations to persist and begin recovery in the Castle, the extent of the trail network needs to immediately be drastically reduced or eliminated. These trails have well documented effects on the forest ecology and the resident plant and wildlife species in the area. Without immediate significant reductions in the trail network, and close monitoring and enforcement of OHV activity, the mere designation of the Castle as either Provincial Park or Wildland Provincial Park does not offer sufficient meaningful protection on the ground. The elimination of logging, mineral extraction and new surface access to petroleum and natural gas commitments is a helpful step, but is not sufficient so long as the trail network remains in place. One without the other seriously limits the effectiveness of stopping the abuse. The existing designated trail network outlined in the current access management plan is problematic for other reasons as well. All westslope cutthroat trout (WSCT) critical habitat areas that are protected by law are impacted by the current trail network (Map 1). It is critical to remember that it is illegal under SARA to damage critical habitat. Trails and motorized activity in areas outside the designated critical habitat, such as hill slopes paralleling the stream outside the buffer, or upstream of the critical reaches, still cause siltation that flows downstream and becomes a threat to that habitat. Even in areas not flowing into designated WSCT critical habitat, streams still have the potential to provide good habitat for sensitive aquatic species, once properly recovered. This recovery cannot take place in the presence of ongoing motorized activity. 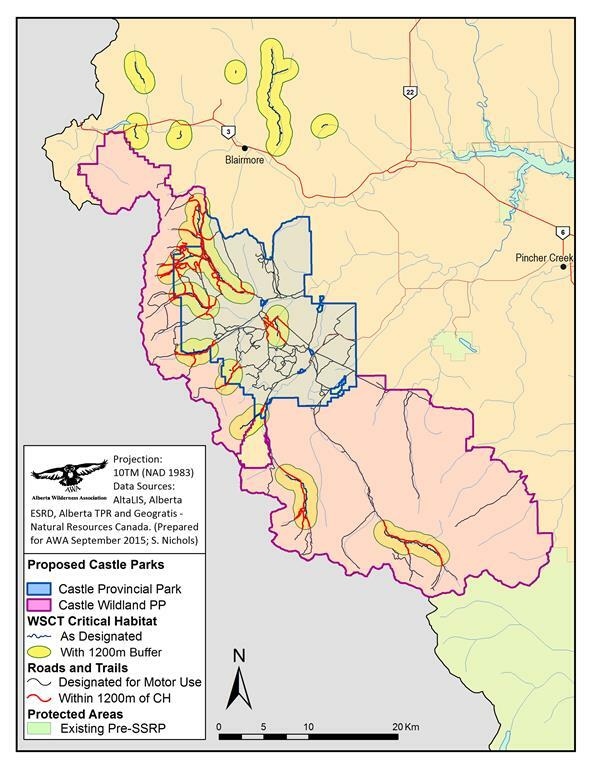 Map 1: Castle parks showing 135 km of designated motorized trail or road (in red) within 1200m of westslope cutthroat trout critical habitat streams. Snowmobiles also cause widespread impacts on the environment. Winter is a particularly stressful time for many animals as they cope with lower food availability and higher metabolic demands. Snowmobiles can cause increased stress levels, displacement and changes in animal behavior. Moose, which are adapted to heavy snow and long winters, are significantly disturbed by humans, with a zone of disturbance within 300m of snowmobile trails (Colescott and Gillingham 1998). During a 20 week winter with snowmobile use each winter, the increased energy costs to white-tailed deer fleeing from snowmobiles was enough to require an additional 40 days of nutrition (Severinghaus and Tullar 1978). In the Yellowstone National Park area, wolves had higher levels of glucorticoid production (a stress hormone) in areas and times of heavy snowmobile use (Creel et al. 2001). The snowmobile trails themselves also cause impacts. Compacted snowmobile trails are used readily by coyotes, which adapt readily to human modified areas (Gese et al. 2013). The increased ease of travel by coyotes means that they are able to hunt in areas normally not accessible to them and increases inter-specific competition with other predators such as Canada Lynx. Compacted snow by snowmobiles also severely limits movement under snow for small mammals and invertebrates. Even moderate snow compacting can cause widespread deaths of small mammals, reducing their ability to burrow in snow for insulation (Bath and Enck 2003). Snowmobile emissions release lead, volatile organic compounds and metals. These emissions are absorbed by snow and accumulate in the winter snowpack. Spring melt contains an accumulation of these emitted substances, leading to runoff into streams. Accumulation of contaminants in a pond within a snowmobiling recreation area was found to increase the concentration of lead in the pond water from 4.1 parts per billion before the snowmobiling season to 135 parts per billion by the end of the winter. The pattern was similar for hydrocarbons; there were no detectable levels of hydrocarbons before the season but which increased to 10ppm in the pond during the spring melt. Brook trout held in aquariums containing this melted snow water showed increased levels of lead and hydrocarbons in their bodies, which resulted in significant diminished stamina compared to in aquariums containing no melted snow (Adams 1975). In Yellowstone National Park, increased levels of volatile organic compounds are associated with areas receiving higher snowmobile traffic although levels of these chemicals were below recommended thresholds for aquatic ecosystems (Arnold and Koel 2006). A consideration omitted from this study is potential effects of the accumulation of these chemicals are on a broader watershed scale. In summary, motorized recreation is not compatible with ecosystem protection, let alone ecosystem restoration. In addition, continuing motorized reaction will create a negative experience for new visitors interested in visiting this area and may deter them from returning. AWA believes the decision to continue OHV use for up to five years may delay building a positive and loyal visitor base for many years, therefore delaying providing benefits to adjacent communities. We understand the phase out of off-highway vehicles has been proposed in order to allow time for the government to identify more suitable areas and to determine appropriate sites to allow OHV use on other public lands. This work by the government could be completed in much less time than the currently proposed 3-5 year window and AWA believes is not sufficient reasoning to delay sound decision making for our parks. AWA respectfully requests that all motorized recreation be banned from the Castle Provincial Park and the Castle Wildland Park immediately. AWA believes that the Natural Landscape Zone being used as a default should be amended as soon as possible as we believe the Wilderness Zone is more suitable to conserve the larger undisturbed wilderness landscape of the Wildland Provincial Park. We look forward to more protective zoning being placed inside these parks. Currently missing within the draft management plan is any mention of plans to manage existing and new petroleum and natural gas commitments. It is important for the draft management plan to contain a life-cycle plan regarding those developments. The draft plan currently lacks any agreements about the conclusion of operations by a certain date that will include restoration and reclamation commitments. The memorandum of understanding method used in the Hay-Zama Wildland Park can serve as a model for this approach. AWA also notes there is a lack of any language within the draft management plan to address existing sand and gravel commitments. AWA believes that any sand and gravel commitments must be subject to an Environmental Impact Assessment to determine if the commitments should be allowed to continue. It is also important for the draft management plan to contain a life-cycle plan regarding those developments, including clear restoration requirements and end dates of operation. AWA urges the government to take all possible measures to prevent the exploration and development of freehold minerals in the Castle Parks. In conclusion, the ability of the Castle ecosystem to be restored hinges on strong, scientifically based management plans with appropriate implementation and enforcement. Thank you for your consideration of AWA’s comments. We look forward to your response. Adams, E.S. 1975. Effects of lead and hydrocarbons from snowmobile exhaust on brook trout (Salvelinus fontanlis): Transactions of the American Fisheries Society 104 (2): 363–373. Arnold, J.L., and T.M. Koel. 2006. Effects of snowmobile emissions on the chemistry of snowmelt runoff in Yellowstone National Park—Final report: Yellowstone National Park, Wyoming, Report YCR-2006-1, Fisheries and Aquatic Sciences Section, Center for Resources. Creel, S., Fox, J. E., Hardy, A., Sands, J., Garrott, B., and R. O. Peterson. 2002. Snowmobile activity and glucocorticoid stress responses in wolves and elk. Conservation Biology 16(3): 809-814. Olliff, T., K. Legg, and B. Kaeding, editors. 1999. Effects of winter recreation on wildlife of the Greater Yellowstone Area: a literature review and assessment. Report to the Greater Yellowstone Coordinating Committee. Yellowstone National Park, Wyoming. 315 ppg. Severinghaus, C.W. and Tullar, B.F. 1978. Wintering Deer Versus Snowmobiles. New York State Department of Environmental Conservation.